This information was contributed by Eli Valk. An event in honour of the beginning of the restoration of Rezekne synagogue and the creation of the Heritage Centre of Wooden Architecture and exhibition about the Jewish culture was held on April 2nd, 2014. Rezekne and Jewish community had been waiting for this moment for a long time. Currently it is the only wooden synagogue in Latvia, which has survived in its initial shape. In addition, the synagogue is the oldest wooden synagogue in the Baltics. The Chairman of the Jewish community Leo Sukhobokov said that this project enabled to preserve the Jewish heritage: "Preserving the synagogue means preserving the heart of the Jewish culture." (ISJM) David Michaelson has provided me with an update and links on the long hoped for/planned restoration of the Green Synagogue of Rezekne, Latvia, a project which he first brought to my attention almost ten years ago. David's great-grandparents were from Rezekne, a town which had the substantial Jewish population of around 20,000 people before 1900. At the time of the Second World War only 10,000 Jews lived there, and now only small number - a few dozen Jews at most - still live there. He and his wife first visited Rezekne in 2003 and were shown the closed and dilapidated (Green Synagogue, built 1845) by Rashel Kuklya, head of the small Jewish community. The building was last used by the Jewish community in the early 1990s. Note from Dave Howard - You can read a very detailed account with many more photos in David Michaelson's Family History Page. Rezekne, Latvia. Green Synagogue. Photos: Aadne Sollid (2009). 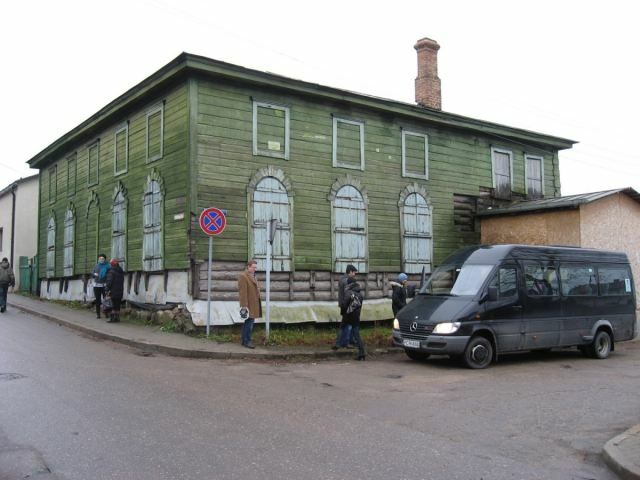 The Green Synagogue, which is built of wood, is the only synagogue building (of at least 11) to have survived in Rezekne. While the government had considered restoring the building as a museum, the cost of the project (then estimated at $160,000 - $165,000) was daunting. At that time the emphasis on Jewish heritage and Holocaust commemoration projects was in Riga, the capital of the country and where most of the country's Jews live today (Riga's beautiful Egyptian Revival/Art Nouveau Peitav synagogue was restored in 2009). The Kadisha Synagogue in Daugavpils was also restored in the past decade. But the survival of the Green Synagogue is now more important than ever, since the wooden synagogue in Subate, Latvia, was destroyed in 2009. David, however, was not to be put off. With some assistance from the International Survey of Jewish Monuments and Meier Melers of the Jews of Latvia museum in Riga, David was able to submit an application to the World Monuments Fund, which WMF approved for funding of a preservation plan. At first, the hope was the EU funding would become available for the restoration. Eventually, however, a Norwegian team adopted the project and after several attempts received funding. It appears that the WMF-funded plan is still the basis for the project, which will begin this spring. Norway is not a member of the European Union, but to have access to the European markets, the country is required through the Agreement on the European Economic Area (EEA Agreement) to support projects in "new" EU countries. The Green Synagogue project is one of these, costing EUROS 711 000 (close to one million US dollars). 85% of the funding come from Norwegian grants, 10% is from the Latvian culture ministry, and 5% from the Rezekne municipality. It is interesting to note that the basis of the project is the exchange of restoration, craft and education skills between Norway and Latvia, and unlike similar projects funded by international donors, the Jewish history and significance of the building did not (at least overtly) play a major part the scope of the project. The restoration of the building will engage students and teachers from Sam Eyde vgs, the Lunznava vocational school, the technical school Vilanu, the Rezekne art school and local artisans in Latgale; organize and strengthen cooperation between regional (latgalske), National (Latvian) and international (Norwegian) craftsmen, teachers, students and authorities; organize workshops for participants to develop meeting and communication models; and rain craftsmen, teachers and students in the restoration of wooden structures. According to the project website the synagogue was chosen because the wooden construction is similar to that in Norway from the beginning of 18th century (the synagogue was built around 1845), it is not privately owned, and it is the only surviving wooden synagogue in the area. The Green Synagogue is one-and-a-half story square-plan building with a shallow four-slope roof. The facade is modest; the windows of the ground floor have semicircle lintels, and above them are "blind windows". Inside, benches, bimah and Ark are still intact, but these may not be original to the building. The building suffered significant water damage until the roof was repaired with government funds a few years ago. The interior painted ceilings are in bad condition with sections missing and the interior walls also are damaged. Overall, the exterior is in better condition but also shows signs of damaged timbers including some damage that may be the result of vandalism over the years. After restoration (which should take 18-24 months) the synagogue will be a part of the Latgale (which is the region of Latvia Rezekne is in) Cultural Museum. It will be available for use as a synagogue upon request. It is not clear how this work, but militarism arrangements have been made at restored historic synagogues in other countries.